144 Year 7 students at UCL Academy have been learning about the waste-energy-food cycle as part of a six-week environmental engineering educational programme led by Dr Aiduan Borrion (UCL Civil, Environmental &amp; Geomatic Engineering), in the first major collaboration between UCL Engineering and UCL Academy. 18 million tonnes (£23 billion) of the UK's edible food ends up in landfill, with London's food waste alone representing 6.3 million tonnes of greenhouse gases. 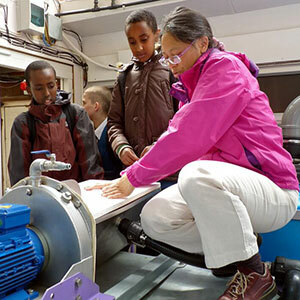 The educational programme was designed to change attitudes to waste and highlight its value as a material and energy resource, and was funded by UCL's Public Engagement Pathways grants and the EPSRC (Engineering and Physical Sciences Research Council). Developed in collaboration with Community by Design and Squared Root, the programme was closely linked to UCL Academy's year 7 curriculum. It aimed to raise awareness of food waste, highlight recycling and the possibility of using waste as a resource for energy and fertiliser. Over the six weeks, the students undertook a range of activities centred on food waste and energy recovery, including conducting a food waste audit in the school canteen, interviewing kitchen staff on energy use and waste generation and engaging with their families in home waste challenges. The programme was designed to give students a greater understanding of real world engineering challenges and how engineering solutions can positively impact society. Students also visited the Healthy Infrastructures Research Laboratory at UCL to measure the energy content in food waste, before touring Camley Street Natural Park near King's Cross to see a functioning anaerobic digester. The digester breaks down biodegradable material for waste management and to produce gas for use as a fuel. This is precisely the sort of inspiring, interesting and important project that reflects how engineers change the world. Taking on the role of environmental engineers, the students then built two small scale anaerobic digesters of their own and created posters and sculptures as part of a food waste reduction campaign. The communication materials produced by the students will be displayed in a public engagement event on the waste-energy-food cycle at Camley Street Nature Park on 23 July (2-6pm). This innovative community-based learning approach showcased the connections between UCL research projects and local issues on waste management. A team of UCL students (including third year undergraduate, MSc and PhD students) contributed to the programme's activities on the waste-energy-food cycle. These community-related connections help UCL students better understand and engage in the learning process and develop their science communication skills. Professor Anthony Finkelstein, Executive Dean of UCL Engineering, said: "This is precisely the sort of inspiring, interesting and important project that reflects how engineers change the world. We always enjoy working with our close partners at UCL Academy who share our ethos and our enthusiasm for engineering education." The students and staff at UCL Academy were also enthusiastic. One student said: "It was great to see how energy can be re-used. I really enjoyed learning about anaerobic digesters and going to Camley Street National Park". Mr Ed Chambers, Curriculum Leader for Engineering at UCL Academy said: "This collaboration with UCL has given our Foundation engineering students a valuable insight into renewable forms of energy and how our habits as consumers have an effect on the planet's resources. They have interacted with and worked as real engineers in creating a working anaerobic digester which has been a very authentic experience." UCL Engineering wish to congratulate all the UCL Academy students for their hard work over the six-week programme, as well as the staff and partners that made it such a success: Dr Aiduan Borrion, Marcelo Elaiuy, Yimumei Wang, Lorenzo Menin, Myrto Skouroupathi, the UCL Academy Engineering Department, Rokiah Yaman from Community by Design, and Marie Monaghan and Damien Wilson from Squared Root.